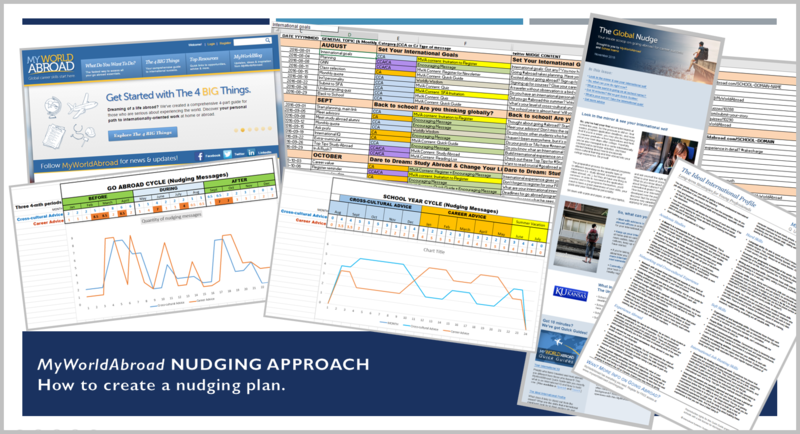 EDITOR'S UPDATE June 2017: Check out our latest information about MyWorldAbroad's nudging service here. In Texas, the concept of “nudging” has been successfully applied to raise graduation rates amongst first-generation university students. This powerful model of affirmative reinforcement can also be used to encourage US students to study abroad, build global awareness, and increase their understanding of the career value of their international experiences. After a brief introduction to the concept of nudging by the session moderator (Marty Tillman), international career advising expert (Jean-Marc Hachey) will outline his student job search model and discuss a variety of nudging tools and strategies that can be employed to support student knowledge acquisition. Emphasis will be placed on outlining communication models to help institutions implement customized nudging plans. Handouts will be provided and mobile-friendly examples will be referenced. Session attendees will also participate in a brief exercise designed to uncover and evaluate effective nudging strategies.